The Samsung Galaxy Note 4 is now the best big phone you can buy, but it's also something more. It's the first smartphone designed with virtual reality in mind — just slot it into the Gear VR headset and a whole new world opens up. I say "the first" because I learned something intriguing at Oculus Connect last month: Samsung is planning to build more. That's right: the Gear VR isn't a stunt to garner publicity and sell a few more Notes. Samsung is serious about virtual reality. That headset, and the Note 4, are just the beginning. Oculus mobile boss Max Cohen says that the Note 4 is merely the baseline for a mobile VR experience that will improve year after year as new Samsung devices come out, and sources tell me that Samsung will be actively tailoring its future phones to embrace virtual reality. And that's a wonderful thing, because there were actually two virtual reality experiences that blew my mind at Oculus Connect. One, of course, was the cutting-edge Crescent Bay prototype headset built by Oculus itself. 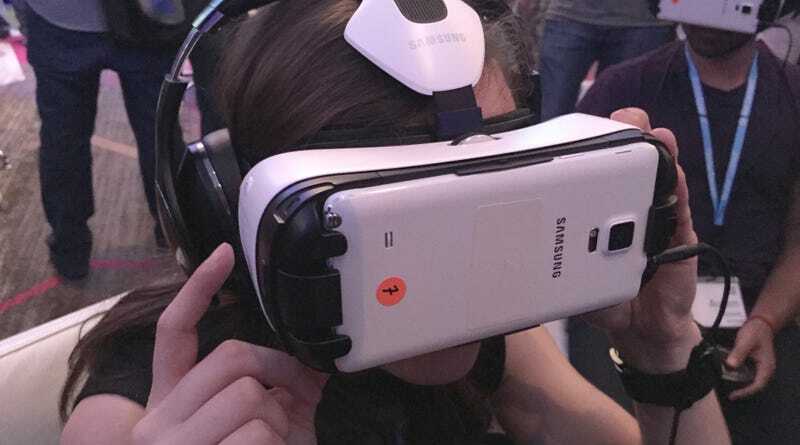 But the other was the simple act of watching a movie inside Samsung's Gear VR. Refresher time: Samsung's Gear VR is basically a fancy box that lets you strap a Galaxy Note 4 to your head. It's got a pair of lenses that stretch and magnify the flat screen across a wide field of view, giving you the illusion that you're completely surrounded by virtual reality. If that were all, it'd be no different than Google Cardboard, but the Gear VR has much better lenses, a rotational tracker and a touchpad so you can swipe through apps. Being completely untethered from a PC has pros and cons. There's no plug-in camera for positional tracking, so though you can turn your head, you can't lean in and around the virtual world. Since the phone itself has to drive the display, it runs at a slower, possibly less disbelief-suspending 60Hz compared to the 75Hz Oculus DK2. And of course, there's a battery that can drain and a bunch of jam-packed smartphone silicon that can heat up. Sure enough, in a game, the Gear VR wasn't nearly as impressive as Crescent Bay. Graphics were rudimentary, and I almost had to force myself to keep my body still. But then I fired up a 3D video, sat down in a comfy chair, and forgot all about it. 10 minutes later, I was ready to buy a Gear VR on the spot. Right now, there are over two dozen experiences being demoed on Gear VR, with everything from VR ports of existing Android games like Bomb Squad and Shooting Showdown to a Legend of Zelda-meets-Minecraft like dungeon crawling experience built by Oculus itself. But what blew me away was a 360-degree video that transported me to the summit of Mt. Haleakala in Maui, then into the center of a Cirque du Soleil performance, and most surprisingly — to a Mongolian yurt where a family simply sat, peacefully eating a meal. Now imagine you can look around. I've seen 360-degree videos before, in and out of an Oculus headset. You can look around and see seams, patches, places where the cinematographers had to visibly stitch some things together and remove others from the frame. You can see weird shifts in perspective which sends up giant red warning flags in your brain. This was different. Seamless. I was there. Afterwards, I spoke to the creators, Felix and Paul Studios, but they wouldn't give up their technologies or technique; only that they use a completely wireless, constantly iterating custom camera system that's the size and shape of a human head. It's designed to make the experience feel as seamless as possible for viewers and subjects alike. They did say that their current rig captures 6K per eye at 60fps, which they master at 4K per eye for the Gear VR itself. But Felix and Paul have no plans to sell or license their tech to others. But as I discovered shortly afterwards in another demo, you don't necessarily need 360-degree content to make mobile virtual reality compelling — because Oculus and Samsung have also turned the Gear VR into the world's best movie theater. Every Gear VR will ship with an app called Oculus Cinema, which simply puts you inside a theater with a giant screen and gives you the best seat in the house. Sounds familiar, no? Except because this is virtual reality and not merely a screen floating in front of your eyes, that theater could be on the surface of the moon. Ever played Heavy Rain, where a special agent has VR glasses that let him turn his dingy office into a zen garden or an underwater paradise? That's real now. The moon theater in Oculus Cinema. Well, one 2D perspective on it, anyhow. Particularly because Oculus plans to release the Cinema source code and — perhaps — even let people sell their own theater environments in the app store. Particularly if new Oculus owner Facebook can let you watch those movies with your friends in the same virtual theater, something Cohen repeatedly hinted at but wouldn't confirm during our conversation. It was better than sitting in a real theater, and immediately made me wonder why I'd ever go to a theater again if I could get my movies this way. When Carmack told me he watched the entire Matrix Trilogy and a full season of Max Headroom in there, I got a bit jealous. It feels like a true killer app for virtual reality. And of course, Samsung wants a piece of that. But as I understand it, Samsung isn't just following Oculus' lead here. The company's Dallas-based research division has been working on what became the Gear VR for two years. By the time Samsung and Oculus teamed up for the Gear VR, Samsung already had a working prototype in hand. Since Oculus needed OLED displays, and Samsung needed head-tracking technology and software expertise, they formed a mutually beneficial arrangement. But according to one source (so take this with a grain of salt) Samsung's future phones will have better trackers built right in, and being a vessel for Oculus and Facebook software isn't Samsung's aim; the company hopes to use virtual reality as a catalyst to drive sales of ever more powerful smartphones while simultaneously throwing off the shackles of Google's Android operating system. With only a single source, I can't say if that last bit is true or not, but it makes a lot of sense. Phones have gotten as big as they can get without becoming tablets, and Samsung seems set with a 5.7-inch screen size for its largest. At 2560 x 1440 resolution, the Samsung Galaxy Note's screen is gorgeous but approaching a pixel density at which you have to zoom way in to tell that there's any difference in text. And, it's been a while since a well-programmed mobile app can challenge a mobile processor. Samsung makes its money from components like those screens and processors, and it needs a driving force to keep people wanting to upgrade. But virtual reality can eat up all the processing power you have and then some, and it leaves plenty of room for screens to improve before they're perfectly suited for being shoved right up to a magnifying glass in front of your retina. As Facebook admitted when it purchased Oculus for $2 billion, virtual reality could be the next great computing platform, making it ripe for Samsung to build an operating system of its own. Samsung's developer conference, scheduled for next month, has six whole sessions on building VR applications. For now, you can't buy a Gear VR. We don't even know what it costs, and both John Carmack and Oculus mobile boss Max Cohen told me this first "Innovator Edition" has limitations that keep it from being a mass-market product. Like Google Glass, it's an early taste of a technology that both companies hope will be mass market before long. But it can already do one amazing thing right now. When I asked Cohen what he personally most wants from virtual reality, he said this: "I want to be transported all over the world. I want to be present at places that money can't buy. I want to be in the studio with Radiohead as they're recording an album. I want to be sitting there and look to my right and I want to see Thom Yorke as he's experimenting." That's actually not too far off. In fact, there's an example much like that in the Gear VR right now: in "Strangers with Patrick Watson," another 360-degree video from Felix and Paul, you can watch a recording artist perform just such an experiment. It's just an ordinary moment in life captured for the world to share. I can't wait to see more.